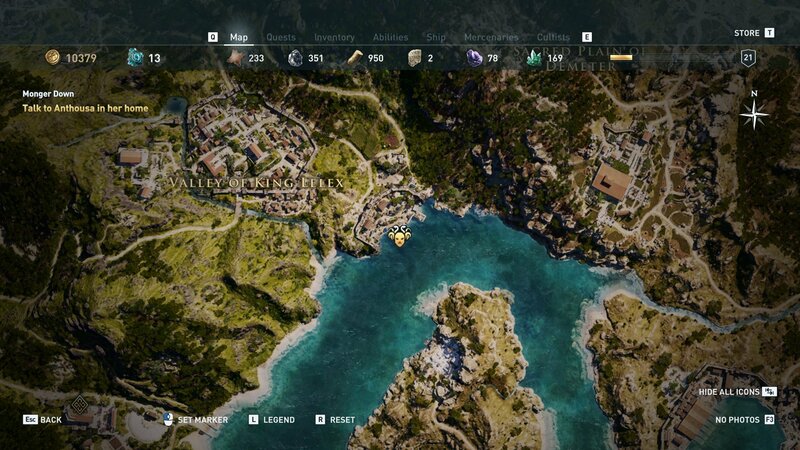 Learn where to find every The Eyes of Kosmos cult member you need to hunt down in Assassin's Creed Odyssey. 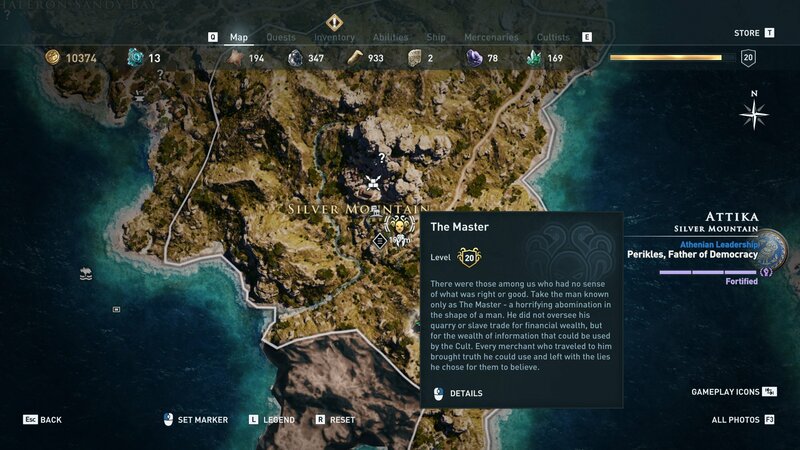 You won’t have to put too much time into Assassin’s Creed Odyssey before you encounter the sinister Cult of Kosmos. Acting largely in the shadows, this fanatical group aims to twist the fate of Greece to their design. You’ll run into a number of cult branches during your adventures, but the first you’re likely to meet is The Eyes of Kosmos. Shockingly, Kassandra (or Alexios) doesn’t see eye to eye with them (ho ho ho), and you’ll be rewarded heartily for finding and assassinating several members of the group. You’ll need to complete a fair chunk of the game’s main story to unlock each target, but defeat them all and you’ll earn the full legendary Snake Set armor and its accompanying legendary dagger, a fine prize indeed. In this article we’ll explain where all The Eyes of Kosmos members are hiding, and what quests you need to complete to face them in Assassin’s Creed Odyssey. There are five Eyes of Kosmos you’ll need to assassinate before a final confrontation with the group’s sage, or leader. 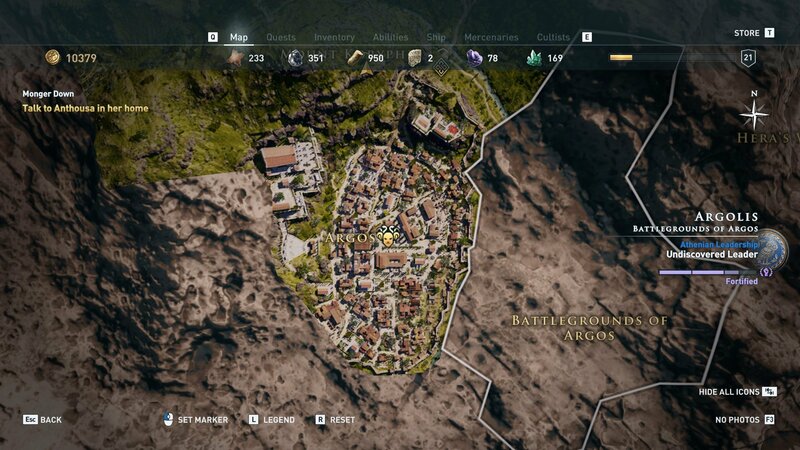 Each is spread across the Attika region, but you first need to unlock the relevant quests before taking them down. The first couple of members are level 15, while the latter set are all around level 20, so make sure you’re levelled up enough before attempting this challenge. Elpenor is the first character from The Eyes of Kosmos you’ll meet during Odyssey’s main story, and starts your hunt for the remaining members. You’ll meet her during the Snake in the Grass mission, as a core part of the quest. Much like Elpenor, Sotera is encountered as part of the game’s main story, this time in the mission The Serpent’s Lair. You’ll be given a clue to her location, and then are free to hunt her down in the Port of Nisaia. Much like Sotera, the chance to take down Midas comes after completing the Serpent’s Lair main story mission. As a lone fighter he isn’t all that much trouble, but Midas comes with a large guard cohort protecting him. Take your time eliminating them first before you move on to the man himself. Complete all the quests on Attika and you’ll finally be given the chance to take out the rest of The Eyes of Kosmos in a series of side missions. You need to complete side quests in the general areas of each target for their mission to pop up. In the case of the master, the quest you’re looking for is called A Life’s Worth and should be located south of Greater Athens. 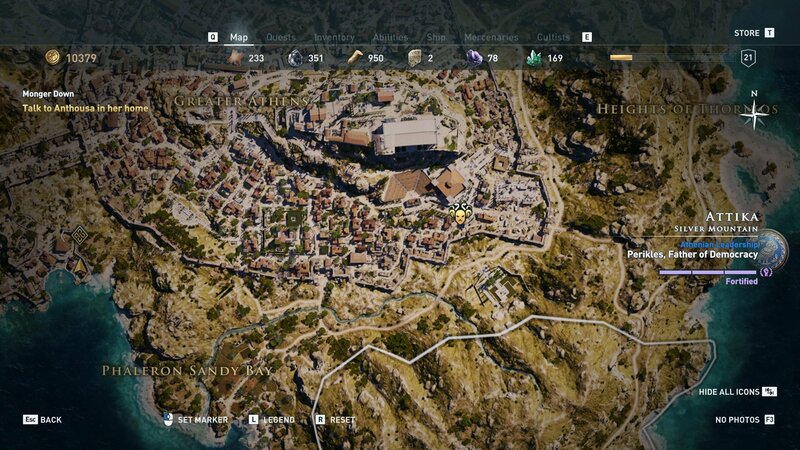 Keep completing side quests in Attika until you see it. The Master is by far the toughest member to kill, but at least you’re rewarded with a sweet hood for your trouble. 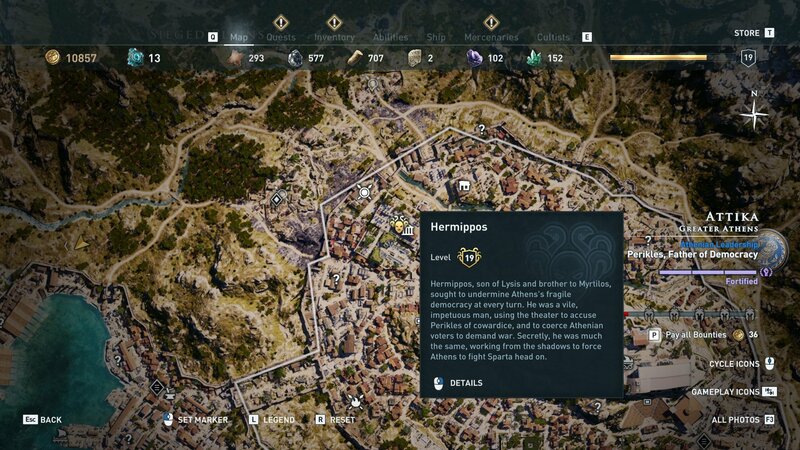 As with The Master, you won’t be able to tackle Hermippos until you’ve completed a number of side quests in the Greater Athens area. The quest you’re after is called Free Speech, but first you’ll need to complete both Citizenship Test and Witness Him. With those out of the way you’ll finally be able to take on Hermippos as an Eye of Kosmos member at the Temple of Hephaistos. Once you’ve assassinated all five members of her cult, you’ll have annoyed The Eyes of Kosmos’ Sage enough to learn her location for a showdown. Nyx the Shadow certainly has an imposing name, but she’s actually not all that bad to fight thanks to the fact that she tends to travel alone. As long as you’re levelled up enough for the challenge (which you should be, having tackled the last two members), you’ll find her in the Greater Athens region of Attika, southeast of the Statue of Athena. Take the fight to her and once she’s down you’ll not only have finished off the Eyes of Kosmos, you’ll also earn yourself the Dagger of Kronus too. 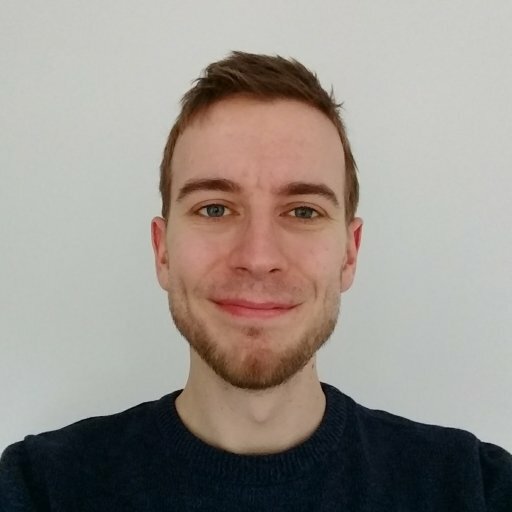 You won’t need to equip the dagger in order to earn the Snake set armor bonus (+10% Intoxicated Damage and a Weakening Effect), but it’s a pretty powerful weapon in its own right. The dagger grants a bonus 40% damage when attacking from behind, making it the perfect tool for the more discrete Greek. Taking down the entire Eyes of Kosmos cult is no minor feat, and the legendary Snake set armor is a well deserved pat on the back for doing so. With that faction down, you’re not free to get back to enjoying the rest of what Assassin’s Creed Odyssey has to offer. Have you been collecting Ainigmata Ostraka riddles while out and about? Take a look at our guides for them - here’s where you need to go for the Fatal Attraction riddle treasure, while over here is the Backstage Pass Ainigmata Ostraka solution. 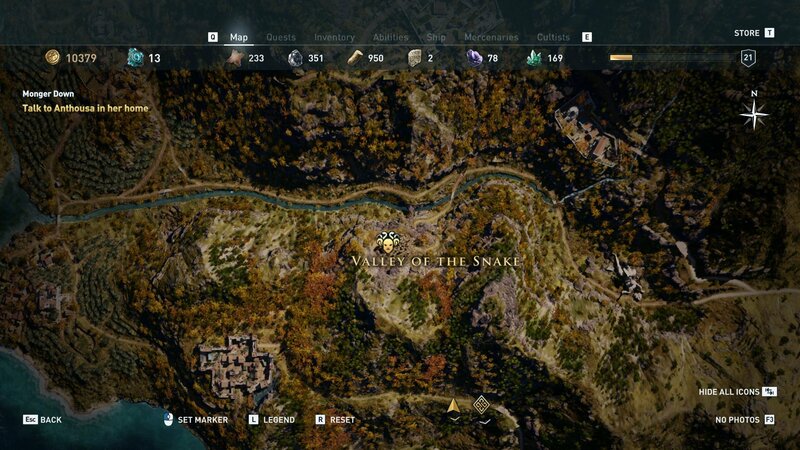 If you're not sick of cults, there are also two more hiding out there for Kassandra or Alexios to put to the sword. The next logical choice is to take on the Silver Vein, but you could also choose to go after the seafaring Gods of the Aegean Sea. Be warned though, both groups offer much, much tougher targets than The Eyes of Kosmos.